On her 49th birthday, Anna Fergusson, Boston neuroscientist and dedicated introvert, arrives at an unwanted crossroads when the funding for her research lab is cut. With her confidence shattered and her future uncertain, on impulse she rents a cabin for a year on Australia's Great Barrier Reef. However Turtle Island, alive with sea birds and nesting Green turtles, is not the retreat she expected. Here she finds love for the eccentric islanders who become her family; for Tom, the laid-back turtle whisperer; and for the turtles whose ancient mothering instincts move her to tears. But Anna finds that even on her idyllic drop in the ocean there is pain, and as the months fly past her dream for a new life is threatened by a darkness that challenges everything she has come to believe about the power of love. 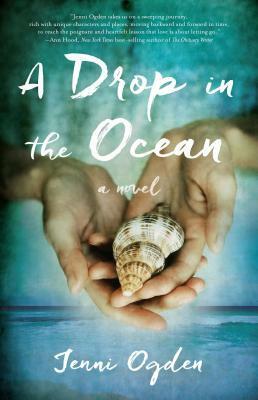 I was first attracted to A Drop in the Ocean by the cover, which just goes to show the power of a good cover! However it has a lot more going for it, than just a pretty face. This really is the story of Anna, a research scientist who has just lost her grant for further research and because of it everything grinds to a stop. Or... you could say it all begins for Anna. Challenged by this she takes a big step and on a whim goes out to Australia to an island on the Great Barrier Reef. She is kind of a recluse, hands off kind of person. In the past she has been happy to head the research but not be involved with the face to face human interaction that her assistants have done. She opted for this kind of life rather than be involved with kind of emotions that real people bring to the table. She has one good friend and is not close to family, i.e her mother. How she changes is at the heart of this story, and it at times brought a tear to my heart. The island is involved with research on the local turtles, and if you enjoy nature and these amazing creatures, you'd enjoy this story. The setting is rough and beautiful. The islanders most certainly are eccentric, but they sure have heart. Among them is Tom, the person gathering the information on the turtles. He is ten years younger than Anna, and when they become close this is a challenge for Anna, how could he want her. However Tom has a secret too, and that could even be more of an issue for him. Anna's area of research is Huntington's Disease. I first came across this when reading Carrie Beckort's Kingston's Project. It is a terrible genetic disease and for the families involved heart breaking. I loved how Jenni Ogden explores this in her novel with such compassion, bringing a very real human face to it. I also liked learning of the ways they endeavour to prevent it being passed on to another generation. There is an epilogue at the end, it is twenty five years into the future. The epilogue updates the reader on what has happened for the beloved characters and how they have chosen to go forward in their lives. Very satisfying! of Northern New Zealand. She also has a second home in Northern Queensland. In her youth she spent time with turtles and helped with the tagging. There is a giveaway open on Goodreads for A Drop in the Ocean until May 7th. Open to US, CA, Aust, NZ and more. It sounds good, and Turtle Island sounds like a place I wish I could visit! Epilogues that show us the future are great, aren't they? This book sounds fascinating...thanks for sharing. The cover call to me as well. I like the sound of this story. I love the cover as well and the story sounds like one I would very much enjoy. I love books where there's some kind of upset and the main character ends up finding their footing in the aftermath. I love the uniqueness of the setting and that the epilogue is for that far into the future. I'm definitely adding this to my TBR. I think I'd like this especially after reading Inside the O'Briens earlier this year (about Huntington's Disease). The cover attracted me when I saw it. Both book cover, the storyline and now your review attract me to this book. I would love to read it! Sounds like a very unique plot. Plus, the cover reminds me of vacation! I too liked the cover but your review makes it more enticing. Thanks for sharing. I am having a hard time getting past the picture of the coconut cake! Outstanding cover, to say the least!